I’ve developed an inexplicable fascination for cupcakes. It could be the inch-thick sugar toppings, the heart sprinkles or the cute little trays they’re displayed on. But every sighting of these evil treats sends my normally logical brain into semi-paralysis. Imagine my horror at seeing a whole box of them at the tea party I went to over the weekend. I stared at the vile things as they got placed on a Versace tea set. The pinnacle of decadence being served with relatively-innocent masala chai. Of course, I went home clutching the two leftover cupcakes. I ate them for desert, following a dinner of two toasts. And spent the night tossing and turning from the self-inflicted, sugar-induced high. Strangely, it made me think about raita.Â That, and a reader’s request for a Cucumber Raita recipe. Raita is to Indian food the complete opposite of what cupcakes are to a restful evening. The savoury yogurt salad soothes the taste buds, calms the tummy and aids digestion. Also provides a generous helping of whatever vegetables go into it. 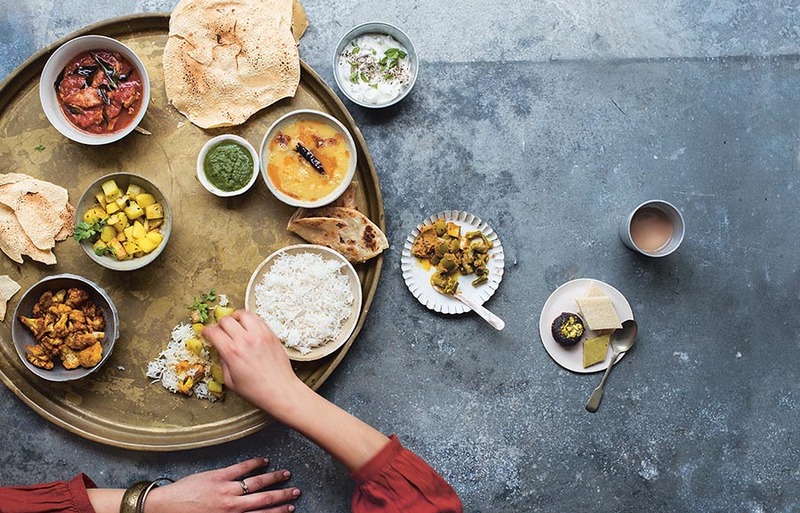 There are so many raitas – cucumber, kachumbar (finely chopped mixed salad), anda (my favourite egg raita), aloo (potatoes), aubergine and boondi (made with little deep fried gram flour balls). The principles are pretty much the same: filling steeped in yogurt. Spiced either with a sprinkling of spices and herbs or with a tadka (tempered ingredients). Every family has its own variations. 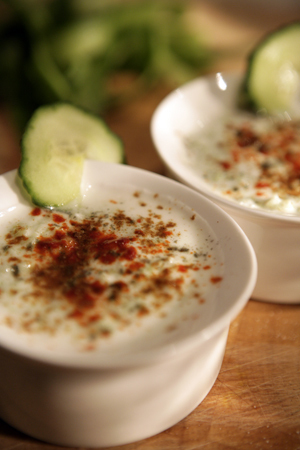 Cucumber raita is an all time classic. It stupendously easy to make. Refreshing. And very authentic served alongside a simple Indian meal. This is how I make the best cucumber raita. Without the fancy touches. Whip the yogurt well in a small bowl with a fork until you get a smooth, pouring consistency. You may need to add a bit of cold water depending on the thickness of the yogurt. Peel and chop the cucumber into tiny pieces. I just used my chopper. Dry roast and powder the cumin. I make a big batch of roasted cumin powder in one go and would recommend you do the same. Then all you have to is assemble the raita. Stir the cucumber into the yogurt and sprinkle all the spice powders on the top. If you add some dry mint, you get cucumber and mint raita. Serve it alongside a vegetable pulao and you have a comforting and simple TV meal. hilarious sweety! !cupcakes are like that….you cant help loving them!! lovely pic of the raita….i’ve stayed away so far from the sprinkle of cumin powder…. i think i will try this the next time i make raita….take care! Love the recipe… pic looks so colorful..
Me? I am not a fan of cupcakes even though I love desserts of any format. Cupcakes and raita? Now that is an interesting connection. Love this raita. this looks really coool raita..
Love this stuff, esp. in the summer time. Tagged you for Breadline Africa. I’ll take the raita, thanks, not too much of a sweet tooth!